Keyboard Creations! lets the player type in a main message which will continually scroll across the screen. The game also lets the player set up an "alarm" message which can pop up every 30 seconds. 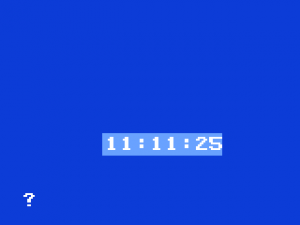 The player can also set a digital clock to keep track of time. Movie Madness! : 1 player names a movie and it's up to the other player to type in as many people that are associated with that movie. The main objective is to fill in as many characters(up to 99) of the main message as possible within an agreed amount of time. Then player 2 takes his turn and the player with the most characters filled in wins. Sportscaster! : Played the same way as Movie Madness, except this time involves naming players of sports teams instead. Identograms! : One player enters a series of clues on a subject and the other player has a limited amount of time to identify the subject. 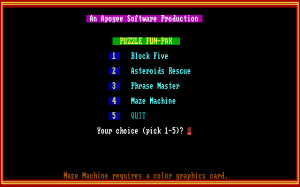 If the subject is displayed on the screen before the player guesses it, the player loses the game. Source Word! : One player names a source word and the other player has only 5 minutes to type in as many word variations as they can by using only the letters contained in the source word. The words may be of any length but no letter can be used more than it appears in the source word. Then player 2 takes his turn and the player with the most characters filled in wins. Tell Tale! 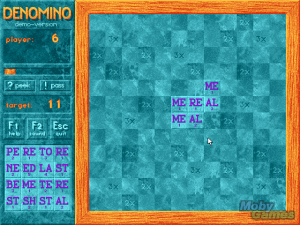 : Players take turns entering words of a sentence. A player completing the sentence before the 98th character is out of the game. A player unable to complete a sentence on exactly the 98th space is out of the game. The game continues until only one player is left. If a player ends the sentence on exactly the 98th space, that player is the winner of the game. Nincompoop! : Player 1 names any vowel the Nincompoop. Then players take turns entering words of increasing length (from 2-5 characters, then the cycle repeats). Anytime the Nincompoop vowel is used the player types Nincompoop in, instead of the vowel that would usually belong there. A player who cannot fit a word of the required length into the 99th space is out of the game. After that player is eliminated, the game starts with anew. The last surviving player is the winner. Chain Letters! : One player names a category then types in a word that would fit in that category. Then the next player has to type in a word that starts with the last letter of that word that still fits in the current category. A player breaking the letter chain is out of the game and the surviving players continue.until only one player is left, or until a player ends a chain on exactly the 99th space. If a player cannot name a category word that fits into the 99th space, that player loses. 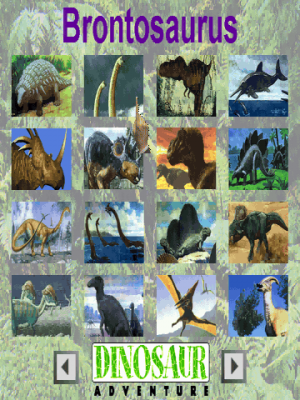 A new category is selected after that, with the other surviving players continuing on the game.